Cynthia Bird is Cree with some Scottish heritage from the Peguis First Nation in the Interlake region of Manitoba, formerly St. Peter’s Reserve near Selkirk, Man. Her spirit name is Wabi Benais Mistatim Equay (White Thunder Horse Woman). She is from the Bear Clan. She currently lives with her family in Calgary. Tansi. Aneen from the Peguis First Nation (Treat 1 signatory) formerly known as the Indian Settlement, then as St. Peter’s Reserve after the signing of Treaty 1 in 1871. Our community of Peguis (Oshki-ishkonigan) is in Treaty 2 territory within the Interlake region of Manitoba. This was not always our home. To properly position our people and community is to acknowledge that we did not always live on reserves. To properly position our people and community is to acknowledge that we did not always live on reserves and that the story of our journey is through our history and relationship to the land and water. The people from Peguis First Nation are a combination of Cree and Ojibwa peoples tied together by what linguists call the Algonquian language family. Our present-day community is an outcome of two peoples from different geographic regions coming together to build a new life in a region they had family and trade ties to. Our stories tell us that our Cree ancestors originally came south, migrating down Lake Winnipeg in the late 1700s to rest in areas on both sides of the Red River near Devils Creek, Netley Creek, Clandeboye, St. Clements, Breezy Point, Cooks Creek, and Sugar Point, close to what is now known as Selkirk, Man. As time went on, the majority of the people settled near Netley Creek. Our Ojibwa relatives came from the east around the Sault Ste. Marie region in the late 1700s under the leadership of Chief Peguis, and they settled along the Red River and north to the point where our peoples came together. 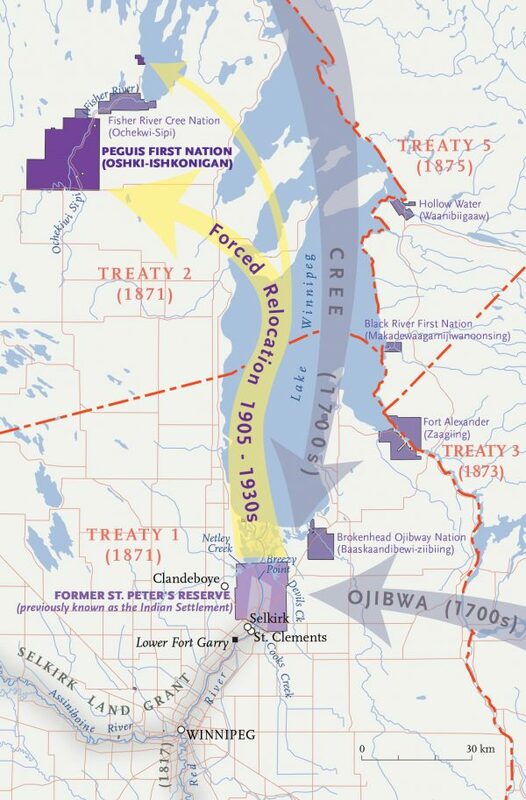 A map showing the relocation of the original Indian Settlement north of Winnipeg. The journey of Chief Peguis and his peoples from the late 1700s onward is documented online and in a variety of literature, most notably at redriverancestry.ca and through the Manitoba Historical Society. These written records of history and Oral Tradition include accounts of when Peguis was born, his journey to the Red River area, and his role as a signatory to the Selkirk Treaty of 1817 through to when he became Chief of St. Peter’s Reserve. The signing of the Selkirk Treaty established one of the first western Scottish settler communities. A little more than five decades later, Chief Peguis’s descendent, Red Eagle, signed Treaty 1 in 1871 as an understanding to share the land and resources with the Crown. The early Scottish settler connections to our people are evident today in many of our Cree and Ojibwa family trees and in family names such as Asham, Wilson, Stevenson, McPherson, and Sutherland. Together, our Cree and Ojibwa peoples occupied this southern territory with their settler neighbours in what was known as the Indian Settlement, until the signing in 1871 of Treaty 1, which created the St. Peter’s Reserve on the Red River, across from what would become the growing town of Selkirk. As the European settlement expanded, our people were moved completely out of the region into Treaty 2 territory, beginning as early as 1905 and through to the 1930s. My paternal grandparents have shared their story of moving to the new Peguis when they were young. This was not an easy move — they travelled by boat up Lake Winnipeg to Fisher River and by land with horse and wagon teams. People had to clear land so they could build their homes and use it for farming and gardening. I am Wabi Benais Mistatim Equay. My family is Cree. Both my mother’s and father’s family stories tell us about our journey through history, which has seen our ancestors travel on northern rivers and lakes to southern points of the forks of the Red and Assiniboine rivers. As a result, in Manitoba, we have connections to communities, peoples and lands on the west side of Lake Winnipeg’s north basin and the south basin. I recall my grandfather, Stanley Bear, telling me the story of where he was born on the banks of the Devils Creek on the northeast corner of St. Peter’s Reserve. This was where his family farmed and worked the land. I imagined it to be a large river with gently sloping banks. My grandmother was born at St. Peter’s Reserve on the northwest side of the reserve around Netley Creek, closer to Selkirk. When I got older, I passed by Netley Creek a few times and realized I should have listened more closely. I discovered Netley Creek is a small creek with gently sloping banks, an easy stone’s throw across to the other side, similar to the Ochekiwi Sipi (Fisher River) where my grandmother’s family settled in the new Peguis. Despite the disruptions in our family history and relocations, our relationships continue to grow as we reconnect and strengthen ties with family and friends who have travelled beyond present-day Manitoba and settled in other parts of the West. In fact, my attendance at a recent Elders gathering in Edmonton led me to connect with relatives from a Cree community called Ochapowace Nation near Broadview, Sask. They are connected to the late Jacob Bear’s family, originally from St. Peter’s Reserve. Today our family members reside at Peguis First Nation, in cities throughout Manitoba and the Western provinces, and in Ontario and Quebec. As for my own family, although we live in Calgary, we continue to have close ties to our home community (Peguis) and to Lake Winnipeg and Great Slave Lake in the Northwest Territories. My husband’s family (Bird, Cochrane) are fishers, and my family (Bear, Asham, Wilson, Murdock) have been farmers and fishers. This connection to land and water continues to be an important part of who we are and my children’s identity. My husband and I have made a commitment to invest time in building relationships with family and in maintaining ties to the land and water our relations and ancestors have travelled. Maintaining these ties has taken a commitment to have the economic means to travel back home and to reconnect to these places. They are part of who we are! We will continue to do this. It is our hope that our children and successive generations will also see the importance of preserving their personal connections to our relatives, the land, the water, and the stories that tell us who we are.